Protesting for equal wages Aboriginal stockmen walked off Wave Hill pastoral station in the Northern Territory in 1966. Little did the white station owners know that the strike would become a precursor to land rights legislation almost 10 years later. The Wave Hill Walk-off followed more than 80 years of massacres and killings, stolen children and other abuses by early colonists. The memories of their brutal treatment over several generations weighed heavily on the minds of Gurindji people long before they walked off the station. Pastoralists who were moving into Gurindji homelands considered the blacksoil plains of the Victoria River District to be prime grazing land. Conflicts ensued, and Aboriginal elders later remembered how white stockmen "shot them like dogs",  took their women for sexual gratification or let children witness the murder of their parents or uncles. Aboriginal stockmen, who had always been the backbone of the northern Australian cattle industry, were not paid wage equal to those of their white counterparts. In fact, it was illegal up until 1968 to pay Aboriginal workers more than a specified amount in goods and money. An attempt to introduce equal wages in 1965 failed because pastoralists argued that equal wages would ruin the industry if paid immediately. It was decided to defer a decision for three years. In 1966 Aboriginal people first protested for equal wages at Union Camp at Newcastle Waters Station, about 270km north of Tennant Creek . The strike focused national attention on the entitlements of workers on pastoral properties across the NT. Although they lost the strike, they started a groundswell of resistance to the appalling working standards imposed on Aboriginal people. It was a catalyst for the Wave Hill walk-off. In January 2009 Union Camp was recognised as a site of historical significance . But Aboriginal people did not submit to this decision. On 23 August 1966, 200 Aboriginal stockmen of the Gurindji people and their families walked off Wave Hill pastoral station, 600 kms south of Darwin in the Northern Territory, owned by a British aristocrat Lord Vestey. Led by Vincent Lingiari, a community elder and head stockman at the station, they set up camp in the bed of Victoria River. The camp moved before the wet season of that year and in 1967 the Gurindji Aboriginal people settled some 30 kilometres from Wave Hill Station at Wattie Creek (Daguragu), in the heart of their traditional land, near a site of cultural significance. One of the first things the Gurindji did after the walk-off was to take the bones of those massacred at Blackfellows Knob around 1924 and accord them with the respect of a traditional burial, by interring them in the caves of the Seale Gorge (Warluck). The Wave Hill walk-off was well supported, including non-Aboriginal people. Unionists Brian Manning, a Darwin waterfront worker and fervent unionist, organised a strike fund with fellow unionists and Aboriginal actor Robert Tudawali and Roper River man and Union organiser Dexter Daniels. Manning loaded his truck with supplies and made the first of up to fifteen 1,600 kilometre round-trips from Darwin to Wave Hill. Manning’s support was key to the strike’s success. The strike made headlines all over Australia. While the initial strike was about wages and living conditions it soon spread to include the more fundamental issue about their traditional lands. The Wave Hill walk-off had morphed into a land claim. Aboriginal leaders petitioned the Governor-General in 1967, requesting a lease of 500 square miles to be run cooperatively as a mining lease and cattle station , and toured Australia to raise awareness about their cause. The Gurindji Aboriginal people were claiming that this land was morally theirs because their people "lived here from time immemorial and [their] culture, myths, dreaming and sacred places have been evolved in this land". This was the first claim for traditional Aboriginal land in Australia. While Vestey's company was prepared to hand the land over, opposition to this unusual and new idea was very strong. The strike went on for 9 years until Prime Minister Gough Whitlam visited the site of the strike and made history with a symbolic gesture. In 2006 the NT government heritage listed the route of the walk-off . A track to share the historic journey with visitors via interpretive signage and specially designed shelters was opened on 19 August 2016, the 50th anniversary of the walk-off. Map: The location of Wave Hill Station at Wattie Creek in the Northern Territory. Today Wave Hill is the area of the remote twin communities of Kalkaringi (also spelt Kalkarindji) and Daguragu (upper Victoria River region, NT). It's about 9 hours south of Darwin. 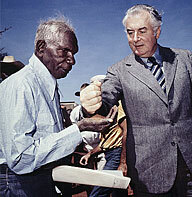 16 August 1975: Prime Minister Gough Whitlam pours soil into the hand of Aboriginal elder Vincent Lingiari at the purchase ceremony of the pastoral lease. Photo: Mervyn Bishop, National Gallery of Australia. Nationally many people resisted the idea of handing back land to its traditional owners. Five years later (the government had changed too), on 16 August 1975, Prime Minister Gough Whitlam (Labor) handed over title to the land to the Gurindji Aboriginal people—the first act of restitution to Aboriginal people and the start of the land rights movement. Gough Whitlam pouring soil into Vincent Lingiari's hands has become a defining moment in Australia's history. The Wave Hill walk-off had paved the way for the Aboriginal Land Rights (Northern Territory) Act 1976. In 1975 the Gurindji people bought the pastoral lease. After the NT government threatened to resume the lease, the Gurindji lodged a land rights claim. In 1986 they gained freehold title to the waterhole on Wattie Creek known as Dagaragu, which is located in the Victoria River Region of the Northern Territory. In May 2004, a memorial to Vincent Lingiari was unveiled as part of Reconciliation Place in Canberra. Many Aboriginal people fondly remember Whitlam and labelled him 'jangkarni marlaka' (big important man) when he died in October 2014 . Today 700 Gurindji live in the communities of Daguragu, on the banks of Wattie Creek and Kalkarinji, formerly known as Wave Hill . The big question is: Was the walk-off and strike successful? Are Aboriginal workers better off? Professor Jon Altman from the Alfred Deakin Institute for Citizenship and Globalisation at Deakin University took a hard look in 2016, the 50th anniversary of the Wave Hill Walk-off and 40th anniversary of the Aboriginal Land Rights Act. "It would be fair to assume that today – 50 years after the walk-off and 40 years after the passage of the federal land rights act – the situation has massively improved and that the problems raised half a century ago have been fixed. But has the situation really improved? “After a period of thirty years of gradual improvement to 1996, things have gone backwards. In 1966 Aboriginal people could walk-off in protest, but today their choices are more limited, there is less freedom. Back then it was the Vesteys Groups, a privately owned UK group of companies that was mistreating Aboriginal labour, today it is the Australian state. "Gather round people let me tell you a story An eight year-long story of power and pride British Lord Vestey and Vincent Lingiari Were opposite men on opposite sides"
The history of the Wave Hill walk-off has also been turned into a children's book, illustrated by Gurindji schoolchildren and featuring evocative landscape paintings by artist Peter Hudson. From Little Things Big Things Grow was published in November 2008 and is available through One Day Hill/Affirm Press (ISBN 9780975770887). 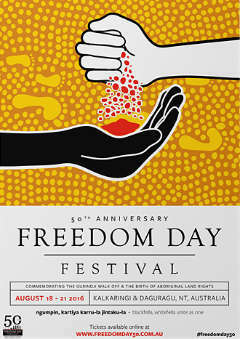 50th anniversary Freedom Day Festival poster 2016. The celebration saw three different posters designed for the occasion. 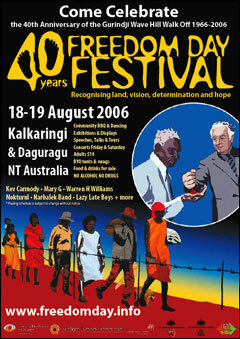 Freedom Day Festival poster 2006. The circular inset replicates the famous photo above. Main images in poster from Mumkurla-nginyi-ma Parrngalinyparla — Out of the Darkness into the light, a collection of banners and accompanying catalogue celebrating the Wave Hill Walk Off (May-Aug 2000). The Freedom Day Festival is an annual celebration of the Wave Hill walk-off. It is a key event for the Aboriginal communities and recognises the contribution made by the Gurindji, Mudbara and Walpiri families to Australia's history. The 50th anniversary of the Freedom Day Festival was held from 19 - 21 August 2016 in the Kalkaringi/Daguragu Aboriginal communities. See www.freedomday.com.au for more details. Claiming land is a difficult and expensive process for Aboriginal people. Many applications wait decades for consideration. Do we have apartheid in Australia? Life in a prescribed community: "People have given up"
National anthem: Advanced, Aboriginal & Fair? Northern Territory Emergency Response (NTER) - "The Intervention"
Was the NT Intervention successful?